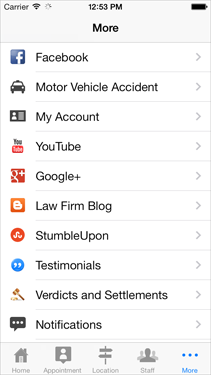 Most apps that are built for attorneys are built to show case the areas within the law practice. This app is designed with the express purpose of retaining your current client base and making two way communication with them and your office seamless. Affordable Legal practice Apps for Your Practice Which Increase Client Retention and Income. Mobile applications and transforming the way businesses communicate with perspective customers and your practice is no different. 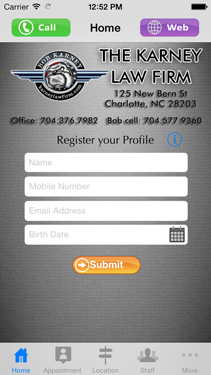 Our Legal firm apps allow for two way communication between your practice and the client. Allows your client to request a time, date and specific service from your firm. Whether it be a new client appointment, updates on the case, etc; the service requests are only limited to your firms offering. One touch button allows for an immediate connection to your firms website. 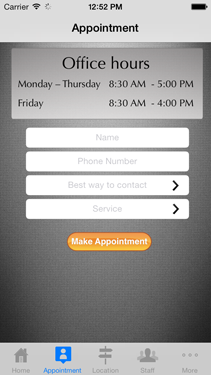 One touch access directly to your firms front desk appointment scheduler. Clients can review your employees and become familiar with your areas of work and highlight your staffs' experience. Geo-mapping allows for directions from the app users location direct to your firm. 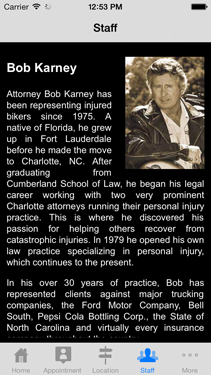 Have your clients been involved in an accident? This feature allows them to create a narrative of the accident complete with pictures of their car and the other vehicle involved. It also allows for voice recording of witness statements which are then sent directly to you. Keep in touch with your users through social media. Regardless of what social media you use, Face Book, Twitter, Stumble Upon, Law firm Blogs, Pinterest, Linked In, etc, communicate with your clients on the platforms they use. Push notifications allow for interaction between you and your client base. Did you just win a large case? Did you settle a case a large dollar amount? Have you updated your blog? Use the push technology to notice your users of changes in your social media blogs, etc. Maintain and encourage engagement with your users. Clients can pay their bill through a secured connection and have the funds directly deposited to your bank account. With this new technology, we found within the first week this app more than paid for itself by sending in three new clients, complete with accident narrative and photos of the vehicle involved in the accident. This product is amazing! 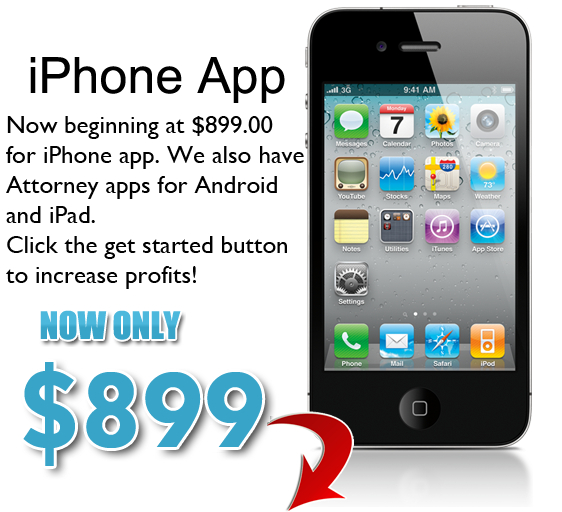 Click HERE to see Tom's app! © 2019 www.bestlegalapp.com. All right reserved.